Antibody was affinity purified using an epitope specific to PCNA immobilized on solid support. The epitope recognized by A300-276A maps to a region between residues 75 and 125 of human proliferating cell nuclear antigen using the numbering given in SwissProt entry P12004 (GeneID 5111).Immunoglobulin concentration was determined by extinction coefficient: absorbance at 280 nm of 1.4 equals 1.0 mg of IgG. Detection of human and mouse PCNA by western blot. Samples: Whole cell lysate (50 µg) from HEK293T and mouse NIH 3T3 cells prepared using NETN lysis buffer. Antibody: Affinity purified rabbit anti-PCNA antibody A300-276A (lot A300-276A-1) used for WB at 0.1 µg/ml. Detection: Chemiluminescence with an exposure time of 3 minutes. Detection of PCNA Versus DNA Content. Asynchronous Jurkat cells were fixed and permeabilized in a sequential treatment of FACS buffer (PBS, 0.5% triton-X-100, 0.5mM EDTA, 1% BSA) and 100% methanol. 1 X10^6 cells were stained with 0.03 µg anti-PCNA [A300-276A]. Secondary detection was performed with FITC conjugated goat F(ab')2 anti-rabbit antibody [A120-114F], and DNA stained with PI. Detection of human PCNA by western blot and immunoprecipitation. Samples: A. Whole cell lysate (WCL) from A-431 cells. B. WCL (500 µg for IP; 30 µg for WCL lane) from MDA-MB-468 cells. Antibodies: A. Affinity purified rabbit anti-PCNA antibody BL1350 (Cat. No. A300-276A) used at the indicated concentrations for WB. B. PCNA was immunoprecipitated using BL1350, BL1351 (Cat. No. A300-277A) or a mouse monoclonal antibody to PCNA (mAb). Control mock IP was performed using normal mouse IgG (M-IgG) and normal rabbit IgG (R-IgG). 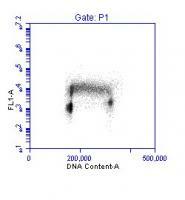 immunoprecipitatesd PCNA was blotted using a mixture of BL1350 and BL1351 (each at 1 µg/ml). Detection: Chemiluminescence with an exposure time of 2 minutes (A) or 5 seconds (B).